Whether you’re done with midterms for now, just beginning them or in the middle  of a hellish whirlwind of exams and essays, you’re probably procrastinating right now. Hello – you are reading the Clog. 1. Plan ahead. In case you’ve been living under Founders’ Rock , you might be interested in knowing that the Spring 2012 schedule  is out and Ninja Courses  is up and running. Not to mention most of the department websites have announced their fall classes. The Freshman & Sophomore seminars  and Discovery courses  sites aren’t updated yet, but that can’t stop you when it’s all in the ever-aesthetically pleasing Courier font of schedule.berkeley.edu . That’s right, it’s almost halfway through the semester, so now that you’re finally sick of your fall classes , it’s time to get excited about next semester – we swear, as we have every semester before, this time it’ll be different. 2. Make a laptop stand . At the risk of sounding like your parents: Do you know how bad for your posture and wrists  those things are? Have any leftover cardboard  from move-in day or an old binder  you’d rather not stare at anymore (Oh, Chem 1A, why must you constantly remind us of your existence?) lying around? Then you can easily solve all of your problems (except for your paper due tomorrow) by making your own DIY laptop stand. There are a variety of different styles ranging in aesthetic and simplicity, and plenty of online resources  to tell you what you need to do. Or you can be like us and tape some stuff together until it looks right. If you start questioning your procrastination, remember, you need to do this to write your paper. You don’t want to end up like this . 3. Talk to people. Junior Thomas Siu swears by his own method, which he calls “being socially productive.” By flirting, building up friendships and “Facebook chatting people you just met” you are acing the midterm of perhaps the most important class in college: your social life . Or you could just play Sporcle . 4. Learn to use a microwave cook. If you’re like us, and your drop-out plan is to join the Cheeseboard Collective , this method is doubly productive. We all need to eat, who can argue with that? If you are cooking-challenged or live in a dorm, you can always make cake in a cup . Seriously, what better brain food is there than cake? 5. Write for the Clog a blog post. 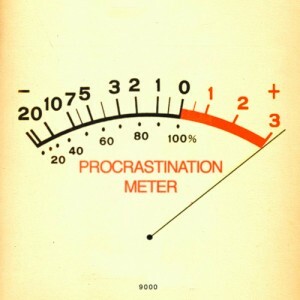 Perhaps one on productive procrastination in an effort to productively procrastinate. C’mon, we know you have a tumblr. Or could start one. Or you may be like us and already have a convenient excuse to avoid studying and write it off as work.